NOTE: Please see the addendum at the bottom of this post, necessary due to the late-breaking announcement by US Soccer of changes to Wednesday’s roster. Some midfielders dream of flicking a pass just beyond the reach of a charging defender. Others fancy a chaotic challenge on the midfield line. For every Lionel Messi, whimsical and poetic when on the ball, there are a hundred Nigel de Jongs, combative without possession and unimaginative with it. Ian Darke, ESPN’s announcer with a gilded tongue, once referred to Wigan Athletic’s midfield as being full of poets and dreamers. Darke’s description was meant to disparage the personnel selections of manager Roberto Martinez. The undermatched side (they lost 5-0 to to Manchester United) needed more muscle in the middle, as their skilled but defensively lacking central midfielders were always in danger of being overrun by the more talented United squad. ‘Poets and dreamers’ need not be a solely critical designation. Few teams can get away with fielding as many creative midfielders as Barcelona, but unless a manager holds to an exclusively counter-attacking strategy, a midfield poet is required. In modern fútbol parlance, a poet would be a creator. Of the three current central midfielder archetypes – creator, passer, and destroyer – the creator is the player most often tasked with penetrating the opposition’s defense. These are the attackers whose passes must have an element of poetry. The Netherlands’ Wesley Sneijder and Germany’s Mesut Ozil were the most successful traditional creators in the 2010 World Cup (Spain’s Iniesta, who scored the tournament’s winning goal, is more of a combo winger/passer/creator). USA’s manager, Jurgen Klinsmann, is currently in search of his own midfield poet laureate. In each of the matches in which he has had access to ‘A’ squad players, Klinsmann has used some type of creative attacking midfielder, whether the formation was 4-2-3-1, 4-3-3, 4-3-1-2, or 4-4-1-1. In January, Benny Feilhaber was solid if not spectacular as USA's attacking mid, completing the majority of his passes but creating just two scoring opportunities (in red). Last month’s friendlies certainly didn’t feature a creator par excellence. The scrappy 1-0 victory over Panama was a tribute to stout defending and outstanding goalkeeping. The defeat of Venezuela – by the same scoreline – owed some credit to a possession-based approach (USA completed 165 more passes). But even that attack could hardly be called poetic. Of the 10 key passes in that match, 8 were from the run of play, though only 4 of those 8 were in the final third. Benny Feilhaber, he of the decidedly dreamer-like Brazilian heritage, was the attacking midfielder in the 4-2-3-1 and and did a decent job pulling the strings, creating two scoring opportunities from the run of play. Venezuela, fourth place finishers in the 2011 Copa America, are currently better than their dearth of World Cup appearances suggests, but Klinsmann has to believe he can get his squad to create more than four run of play scoring opportunities in the final third. Going a game further back (Slovenia in November) reveals more promising statistics. USA’s 2010 World Cup foes, clearly unsure of how to initially defend Klinsmann’s 4-3-1-2, were also victimized to the tune of 10 key passes. In contrast to the Venezuela game, all 10 originated from the run of play and 9 occurred in the final third. However, it’s unlikely that Klinsmann will be able to consistently replicate that production using the same formation. Slovenia eventually took advantage of the isolated fullbacks, and when the center mids cheated wide to offer support, the ball was simply pushed back into the middle. Central midfield remains America’s most stocked area of the pitch; so USA’s gaffer does have some flexibility in the formations he can choose. But – as has been the case for years – true creative players are few and far between. Here's our best guess for the starting XI against Italy. 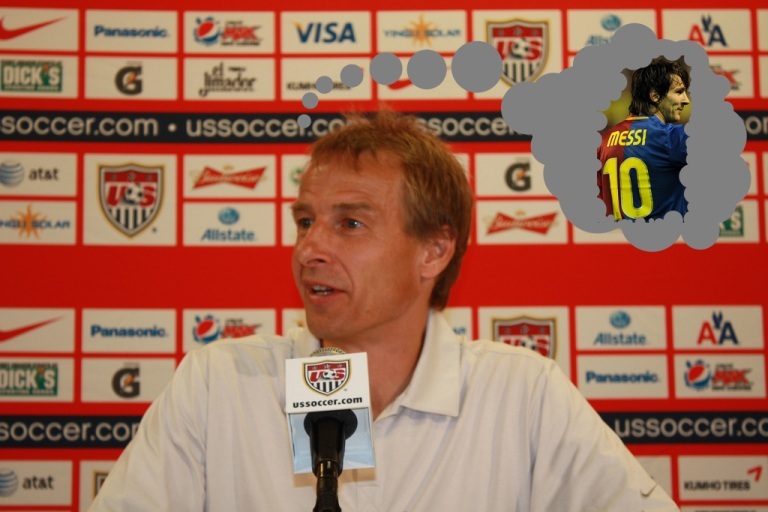 Klinsmann doesn’t have to go far to find destroyers and passers (the pragmatists, if you will). A trio of them have made their mark in Europe. The tenacity of both Jermaine Jones and Maurice Edu was tempered in the Champions League cauldron, and Michael Bradley’s experience in the Bundesliga and Serie A undoubtedly honed his tackling and passing instincts. All three are more than mere bruisers, of course. Jones possesses a long pass capable of instantly starting a counter; Edu has top flight experience pushing into the final third; and Bradley has the feathery touch that provides the perfect link between defense and attack. But none of them are dreamers. The squad for the upcoming friendly with Italy doesn’t have a traditional creator in the mold of Ozil or Sneijder. Though if Klinsmann elects to play a pair of defensive mids, there are a few attackers capable of sitting in front of the holding midfielders and causing havoc. José Torres – At the beginning of the Klinsmann era, the Pachuca trickster had all but assured himself a starting spot in the central midfield trio. An autumn injury curtailed those plans, but his pinpoint passes ensure that, when healthy, he will always be a candidate for a 3-man central midfield. Torres, though, is more of a passer than a creator, a conductor rather than a composer. Note: Torres was injured Saturday evening and might not be fit for Tuesday’s match. Fabian Johnson – One of the German-Americans given a debut by Klinsmann, Johnson troubled Slovenia with his darting runs from midfield. But, again, Johnson isn’t exactly a traditional creator. That’s not to say he can’t succeed operating in front of a pair of complementary defensive mids. AC Milan’s Kevin-Prince Boateng has demonstrated how a physical, skilled utility midfielder can thrive in a creative role. Landon Donovan – Donovan’s success as an outside midfielder in his most recent stint with Everton probably makes certain he will man the same position for the USA. On the other hand, against Costa Rica in September, Donovan was stationed in deeper, more central areas than he ever has been for the National Team. While the end result was a loss, Donovan didn’t look uncomfortable in his new position. However, as long as he possesses a hint of his once blistering speed, he will be vital in pinning back opposing fullbacks, especially as Steve Cherundolo ages. Clint Dempsey -No other gringo can come close to matching Dempsey’s prolific 2011-2012 form. The Texan is on pace to break his own record for goals by an American in the Premier League, and he’s consistently been the best gringo on the pitch in his recent National Team showings. In the Slovenia match, he pulled the strings as the trequartista – operating just behind the two strikers – and was instrumental in almost every successful foray forward. But, like Donovan, Dempsey is a vital component to the American defense when he plays on the left wing, his preferred position. The opposition’s right back would gladly see Dempsey move to the middle, as none of USA’s other wingers come close to presenting the same threat as Deuce. All of the aforementioned players could potentially trouble Italy’s backline, but none of them naturally fill the traditional creator role. If Klinsmann wants to go that route, he’d be better served to call in Sacha Kljestan, the aforementioned Feilhaber, or, once he returns from injury, Stuart Holden. But even that trio comes with question marks. Kljestan and Feilhaber are frustratingly inconsistent, while Holden is more of a fully-follicled Bradley than a fair-haired Iniesta. Attacking midfield certainly isn’t the only position Klinsmann is concerned about. Left back remains an ever present trouble, and beyond Carlos Bocanegra, there isn’t an obvious first choice center back. Yet a lack of talent in those positions can be somewhat made up for through effort and disciplined positioning. No amount of industry can turn de Jong into Messi. Obviously only a pair of managers have access to Messi. And while Klinsmann might not be able to call on Sneijder or Ozil, Wednesday’s match in Genoa should give him a better picture of which gringos might be poets and dreamers. Last-minute changes to the US roster announced since the release of this post have thrown a wrench into our speculations about Wednesday’s starting XI. According to the US Soccer news release, Donovan, Torres and Chandler have all been withdrawn due to various states of injury and sickness. Called up to replace them are Brek Shea and Sasha Kljestan. How will this impact the lineup and formation? Our best guess is that Johnson will replace Chandler at left back (an established position for him with his German club), but the midfield is a bit more of a quandary. Will JK leave Dempsey wide left and give Kljestan the playmaker role behind Altidore? Or will he move Dempsey inside as that free-roamer behind the striker and put Shea out left? We’re happy to hear your speculations, Gringos! In modern fútbol parlance, a poet would be a creator. Of the three current central midfielder archetypes – creator, passer, and destroyer – the creator is most often tasked with the responsibility of penetrating the opposition’s defense. These are the players whose passes have an element of poetry. The Netherlands’ Wesley Sneijder (SPELLING) and Germany’s Mesut Ozil were the most successful traditional creators in the 2010 World Cup (Spain’s Iniesta, who scored the tournament’s winning goal, is more of a combo winger/passer/creator). Having recently watched Moneyball, I can’t help but suggest that Klinsmann will need to “Billy Bean” himself a dreamer. That is, rather then pine over a would be Messi, he needs to think in terms of replicating the stats and work of a midfield poet. Not very romantic, I know, but a couple of the “dreamier” USMNT midfielders just might, under the right circumstances and formation, be able to cobble together between them the penetrating passes and visionary play that would at least add some poetry to an otherwise pretty nuts and bolts center midfield. Unfortunately, there is no poet on the American squad. While Dempsey can occasionally look like a poet, he really is a striker masquerading as a left-mid. Truly, he is a ballistic missile who fires best from that left-mid launch pad. Ultimately, you want Dempsey flying in as close to goal as possible, not hovering around the 18 looking to create. Similarly for Donovan – he is our best option down the right side where he is a 50/50 bet to cut in for a strike or bust wide for a cross. He is the only American player who has this proficiency with quality. But he is not a midfield poet; a teasing glimpse will show every now and then but we all know his home is on the right flank. And as you said, Torres = passer, Bradley = passer, Holden = passer, Feilhaber = ??? ; not a proven poet among them. The only other player who I think could be a future poet is Adu. But he is still raw, young, damaged and far too inconsistent. But think back to the US – Mexico Gold Cup final and consider just how effectively he meshed with the attack, before the US decided to collectively pack it’s bags. If I’m JK, I probably give Feilhaber another try at it. But only when he has a good “A” side, not a January camp “C” squad. I think Benny could fill the role if surrounded by enough quality. There might be a poet inside him, but he needs a strong posse. I then nuture Adu as carefullly as I can. Bring him along slowly but get him reintegrated with the national team after the Olympics. Speaking of “A” sides, how disappointing is it that there will be no Landon, Chandler, Gooch or Torres for this Italy match. What could have been a great test for our best now just looks like another training match for prospects and grizzled vets. Sadly, that group of defenders doesn’t inspire, but at least Bradley should get another start. The real question is what formation best suits this roster going against a tough opponent? I almost put Adu and Diskerud on the list, and I also think Graham Zusi has a shot at that role sometime in the near future. Formation wise, I still think 4-2-3-1 is the way to go. You can play a possession-based or counter-based strategy using different personnel. Having Dempsey and Donovan allows JK to trade out a striker for a mid and go with a lone Altidore and not lose much. I think this is a lineup that would better possess the ball. However, without Donovan and Torres those plans are out the window. We will probably see Edu w/ Bradley in central, Dempsey roaming underneath Altidore, and Shea on at left mid. I’m guessing Spector gets the call for Chandler (yikes), and Johnson goes wide right for Landon. Not as exciting a lineup and it puts more pressure on our back five, which won’t be a good thing. At least we won’t see any daggars to the heart from Giuseppe Rossi this time! I really have no idea what Klisnmann is going to do now. Johnson might get a shot at left back, Kljestan and Shea could be straight swaps for Torres and Donovan. But if that happens, does Deuce go to the right and Shea to the left? Given all of the injuries, this a ‘What the hell. Let’s experiment’ game, so why not let Spector playing some holding mid? I’ve been jonesing for that ever since we saw him do it for West Ham. Sorry for the lateness and brevity of the replies. I don’t have internet access at the moment (hooray for moving).